When I was a kid, I used to love it when my aunts came over for my mom’s book club gatherings. They would come by the carload. This group of radiant women would enter the house and fill it with warmth. And food. And laughter. And hugs. And brilliance. And stories. And the kind of grown-folks’ talk that kids like me always wanted to hear, but could never understand. I would hide out at the top of the stairs—long after I had been sent to bed—straining my ears to pluck a phrase or a sentence from the affable, brainy cacophony of sound emitted by my aunts and their books in the dining room below me. If I was lucky, I would catch the recitation of an entire passage of text or the telling of a deeply personal anecdote. If you know Liberian women, you know that these women were not my aunts by blood or by marriage. They were my aunts because they went to college, attended church, shared offices, endured husbands, and navigated life with my mother. They were my aunts because when they occupied the same space as my mom, worries were shed, challenges were overcome, and doubts were erased. classrooms. We do not group them to keep them quiet. And quiet does not mean “good.” Each young person that we serve is beautifully and completely human. Dana and Sonja know this. They teach us what years of eavesdropping on my aunts taught me—that book clubs are not merely about books and discussion protocols. They are about the humans that come to them, the people that we become when we are in them, and the powerful people that endure—long after we put the texts down—because we have read together. Book clubs are not quiet. They are not passive. They are not about filling in the blanks, answering the question, or being the “recorder” or “discussion leader.” Book clubs are about finding meaning in texts and finding community in others. Dana and Sonja know this. Though I did not have the words for it at the time, I loved seeing my mother come to life around my aunts. When they came over to talk, my mom seemed taller, happier, more alive. This is what book clubs do. They make us more alive. 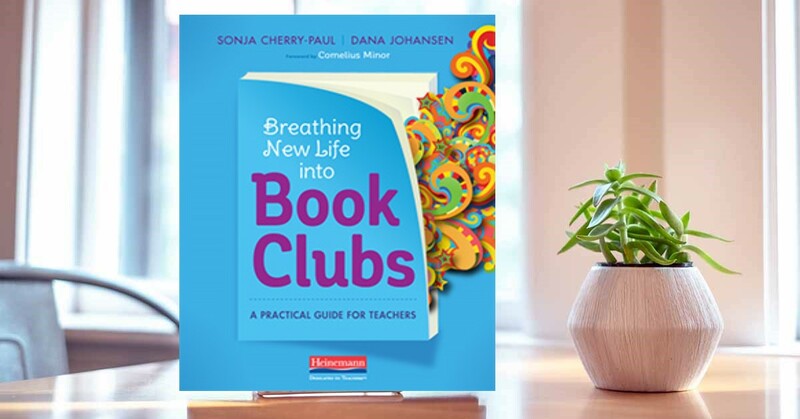 Dana and Sonja’s work is powerful because beyond guiding us into the structures, routines, and lessons that ensure meaningful reading and purposeful talk, they expertly guide us toward crafting the experiences that give children multiple opportunities to live as readers, as thinkers, and as members of a community. Dana and Sonja understand that whenever our society has been confronted with big questions, well-read young people have always been the answer. The Declaration of Independence was written by well-read young people. Well-read young people fought and won the right to vote for women and African Americans. Well-read young people founded the NAACP, GLSEN, and many of the organizations that force us to examine what we mean when we say freedom for all people or education for all children. Though adults consistently fail to act on gun control, climate change, healthcare, or income inequality, well-read young people continue to speak out. On every issue, they are present. In a world that has not learned to listen properly when kids speak, Dana and Sonja teach us how to give kids the tools and supports to keep reading, thinking, and talking anyway. They know that kids who read powerfully, think critically, and listen empathetically to each other will change the world. Just like the generations of well-read kids before them.